Bamiji Permanent Magnet generator is for outright sale, This product has not been previously marketed, but I am ready to market and sell it. The BPMG has a high market potential in that it does not require any geographical or geological features to operate: like solar, Wind and hydro that requires geographical features, the Sun, Wind and Dams. Neither does it require geological features as fossil fuel, fuel cell or even an inverter that needs to charge battery before operation. The BPMG is an all weather generator providing electricity 24/7. It is environmentally friendly with no exhaust fumes. It has no risk of fire disaster, minimum noise. Above all it is maintenance free. 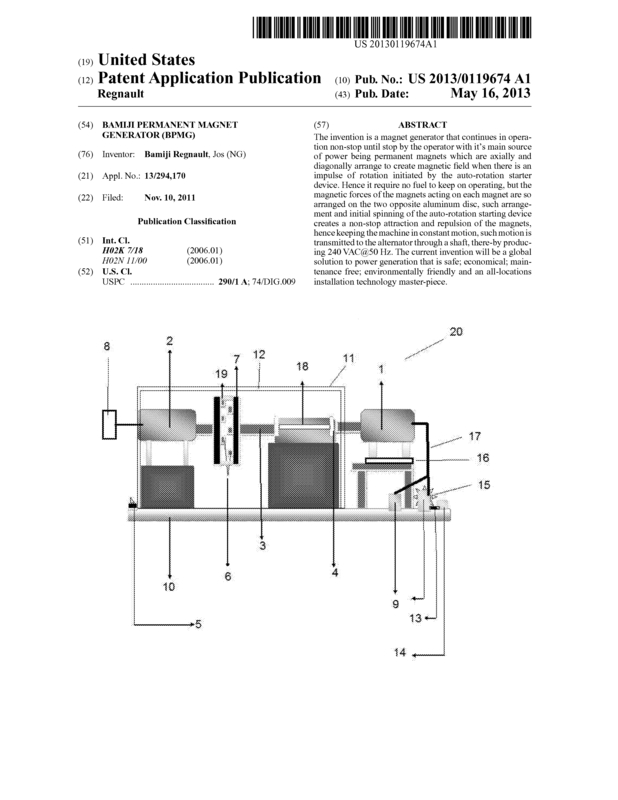 Page created at 2019-04-26 17:51:31, Patent Auction Time.